The library has approximately 380,000 titles (as of the end of March 2015) with a focus on the natural and social sciences. 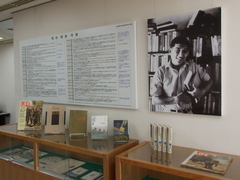 The library has the Okamura Collection, which includes approximately 18,000 titles gathered in Maisaka-cho, Hamana-gun (currently Hamamatsu City), Shizuoka Prefecture, by international photojournalist Akihiko Okamura (1929-85), who is known for his many works, including Minami Betonamu senso jugunki (Record of the South Vietnam War). The library subscribes to about 460 magazine and journal titles and about 30 different newspapers. In addition, about 25,000 online journals can be accessed from university computers(as of the end of March 2015). The great range and depth of the library's resources attract both university and community users. 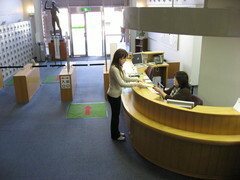 Users are assisted with their inquires on library materials. If they need materials from other institutions, these can be sent in original or copied form. Also, individuals who wish to access materials at the library of another university can be issued instructions and a letter of introduction. 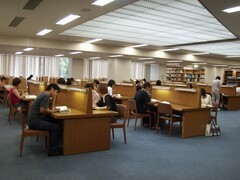 There are a variety of reading rooms for different purposes, with an overall seating capacity of 660. Senior students, graduate students and faculty members may access these 24 hours a day. The library's computer network is updated and upgraded with new systems every five years to make the services more effective. 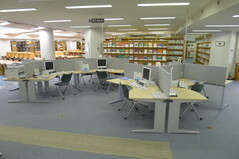 The library research system enables users to search for books within all the libraries of the University of Shizuoka, including the Junior College, and in the libraries of other institutions in Japan. The Audio-Visual Area has audio-visual materials, such as and DVDs, and is equipped with and DVD decks as well as televisions which we can watch terrestrial and satellite broadcasts. It also has a large-screen television that can be used to watch approximately 130 satellite broadcast channels over 30 countries, enabling users to easily gain access to both domestic and foreign information at the library. The University Library is a key resource for undergraduate and graduate students, faculty, researchers, academic guests, visitors and the community at large.